GLENDALE, Ariz. (AP) Five weeks ago in London, the Los Angeles Rams beat the Arizona Cardinals 33-0 , the biggest Rams winning margin in the history of the long series. Now the Rams (8-3) roll into the desert looking to solidify their spot atop the NFC West against the Cardinals (5-6), who are coming off their best win of the season, 27-24 over Jacksonville in Glendale. Los Angeles is a touchdown favorite and, with a win on Sunday, would secure the Rams’ first winning season since 2003. – ”We didn’t show up,” cornerback Patrick Peterson said. – ”It should be an embarrassment when you watch the film, the way we played,” coach Bruce Arians said. But the Rams, predictably, are downplaying the magnitude of that rout as they look for their sixth win in the last seven games. Actually, the Rams led 6-0 before outscoring Arizona 17-0 the final 5:25 of the half. Blaine Gabbert wasn’t even in uniform that day in London. Carson Palmer broke his left arm in the game and Drew Stanton took over as backup, until a knee issue opened the way for Gabbert, who has had two productive starts. 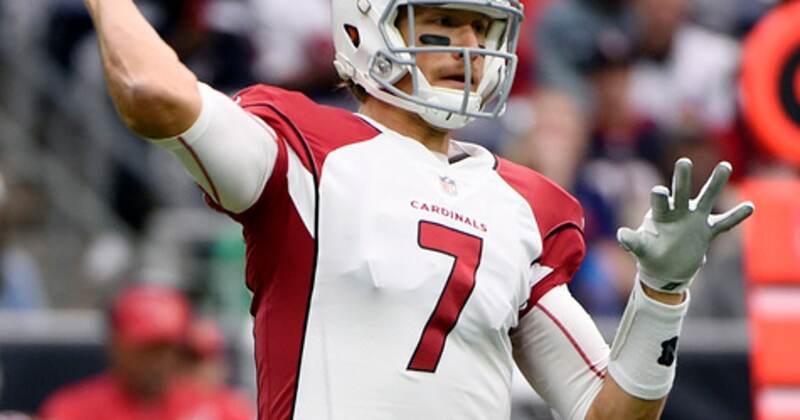 Gabbert said the Cardinals are facing ”a great defense” this week. The Rams are trying to sweep the season series against Arizona for only the second time in the last 14 years. They last did it in 2012. PETERSON’S HEALTH: Arizona running back Adrian Peterson was bothered this week by a neck injury sustained in the Jacksonville game. The Cardinals depend heavily on Peterson to take the pressure off Gabbert, but the Rams effectively shut him down in London, limiting the 2012 league MVP to 21 yards on 11 carries. ROLLIN’ RAMS: The transformation of the Los Angeles offense under first-year coach Sean McVay is impressive. The Rams enter Sunday’s game as the NFL’s second-highest scoring team (29.9 points per game). And Goff has been terrific on the road this season. In games away from Los Angeles, the second-year quarterback has completed 63 percent of his passes for 1,207 yards and 10 touchdowns with no interceptions. Above all else, the Cardinals want to shut down Todd Gurley, who ran for 106 yards and two touchdowns in the London game. STEADY LINE: The Rams are the only team in the NFL to start the same players on the offensive line for all 11 games: Andrew Whitworth at left tackle, Rodger Saffold at left guard, John Sullivan at center, Jamon Brown at right guard, and Rob Havenstein at right tackle. CATCHING UP: The Rams will be without top receiver Robert Woods (shoulder) for the second straight game, but the passing game thrived in his absence last week with big help from two rookies. Cooper Kupp set career highs with eight catches for 116 yards, while Josh Reynolds caught his first TD pass. Goff has confidence with multiple targets, including tight ends Tyler Higbee and Gerald Everett, another rookie. DICKERSON’S COUSIN: Hall of Famer Eric Dickerson is the greatest running back in Rams history. But he will be rooting for a good performance (not an Arizona win) by a Cardinal – his cousin Ricky Seals-Jones. Seals-Jones is an undrafted rookie who played wide receiver at Texas A&M but switched to tight end with the Cardinals. The past two games, he has seven catches for 126 yards and three touchdowns.